The Walking Dead Review: "The Calm Before"
“The Calm Before” is one of those Walking Dead episodes where a sense of tension is heavily amplified by having read Robert Kirkman’s original comic book source material. Those of us who have read through the Whisperer arc of The Walking Dead comic will never forget the splash pages of heads impaled upon spikes—the deaths of several notable characters came as a true shock, especially given their identities. In the comic, it was the death of King Ezekiel and a (pregnant!) Rosita that shocked our sensibilities. Here, the fact that it’s the likes of Tara, Enid and Henry—characters we’ve often derided in these reviews—still does little to dull the shocking effectiveness of the tableaux. All in all, this is probably the most purely devastating and emotionally affecting episode of The Walking Dead we’ve seen in the last couple of years. The fact that they wrung this kind of reaction out of the deaths of those characters speaks toward the filmmaking craft on display. I want to make a point of that, because “The Calm Before” is directed by a first-time Walking Dead director, a woman named Laura Belsey, and it shows. From the moment it begins, there’s a curiously different energy to this episode. Everything is given room to organically breathe. Each exchange seems strangely meaningful and fraught with portent. Some of this is no doubt thanks to the feature film-like run-time, but Belsey demonstrates an immediate gift for naturalistic exchanges between these characters. Granted: I have issues with some of the decisions that “The Calm Before” makes, especially on the script side, but man—from an execution standpoint, this episode was a brilliant breath of fresh air. Note to AMC: Hire this lady. Hire her. Just let her direct Walking Dead episodes from now on. Let Greg Nicotero focus on the gore effects. I’m getting a bit ahead of myself, though. This episode gets off to the kind of start we’ve seen on The Walking Dead numerous times before, to the extent that I immediately turned to my girlfriend and said something along the lines of “Ah, we’re loading up some random characters to die, then” while the woman who looked like a cross between Laura Dern and Sarah Paulson was picking the perfect sundress to wear to The Kingdom’s trade fair. That death couldn’t possibly have been more obvious, but even I thought they’d probably be around for more than 60 seconds. My mistake, clearly. It might have been the fastest attempt to ever introduce characters, establish pathos and then cash in on that pathos by killing said characters in the history of cable TV, but its ultimate purpose was in service of Alpha’s infiltration of the fair. So I can give it a pass, for at least contributing to the narrative arc of the episode. And oh, what a heart-warming sight the fair really is, at first. I have to say that I loved Ezekiel’s moment of triumph in the signing of the community charter first written by Michonne, years earlier. That meeting—which included a random Oceansider, confirming that this community does still in fact exist—was filled with poignant little exchanges. God help me, even with all my cynicism toward The Walking Dead, it felt momentous to see some kind of progress being made toward building a real, functioning civilization. Likewise, by the same token, it increases the feeling of tragedy at the episode’s end, to know that these alliances may be dissolved as soon as the accord is signed. In general, the sequences of daily life and interpersonal relationships we see at the fair just come off as unusually engaging for this show. They’re so much more genuine, so much more heartfelt and un-rushed than what we’re used to seeing, that it took me aback. It makes you realize that at this point, The Walking Dead barely even needs a primary antagonist at all. If it wanted to, it could probably tell an equally engaging story about slowly rebuilding society. Hell, I want to see the first session of Eugene’s D&D campaign. What edition are they going to play? Or is Eugene more of a Shadowrun kind of guy? I bet he is. And indeed, it’s the “action” of “The Calm Before” that is noticeably weaker than the character-building. The one major fight scene is chaotically conducted in almost total darkness, making it practically impossible to see what the hell is going on. It’s not the only time this season that this same issue has arisen, which is a little concerning. Don’t give in to the temptation of darkness and shaky cam, The Walking Dead. If you can’t be relied upon for well-shot zombie killing, then that could become a problem. Still, it’s hard to spend much time thinking about that when you end on such a momentously grim note, in a series of severed heads that are conveniently lined up in order of their importance to the series. The Highwaymen are no more, which should be a surprise to no one. Enid was suitably unimportant enough to the plot but visible enough among the cast to make a good, splashy death. Tara is more surprising, given that she’s recently ascended to the leadership position of The Hilltop. 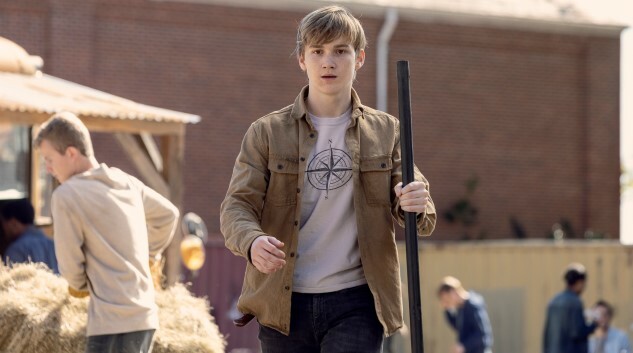 And Henry—well, that IS surprising, given that Henry had inherited Carl’s comic book story arc very neatly this season, and Carl STILL remains alive in Kirkman’s comics. It’s as if AMC ended up agreeing with me that a kid making decisions as stupid as Henry’s could never be expected to live to a ripe old age. He was too dumb and beautiful for this world. — Having four main characters (okay, three main characters, plus Yumiko) wander out in the woods in order to be captured by The Whisperers speaks to the inability of Walking Dead writers to think of any reasonable way that this group can pose a threat to the residents of Alexandria, The Hilltop and The Kingdom. The only way they can come up with for our characters to be imperiled is for them to do things that are hilariously, monumentally stupid, like sending the leaders of two communities (Michonne and Carol) off into enemy territory on their own, dismissing all of their soldiers before doing so. — The biggest logistical problem in the episode by far, though, is how the hell Alpha and co. managed to abduct all of those people from The Kingdom’s fair. At first I thought that Alpha somehow went on a beheading rampage within the walls of The Kingdom, bringing Siddiq along as a prisoner, which is already improbable. But then we see that Tara, Enid, Henry and co. were all alive for a final fight, which I guess means … they all were abducted somehow? We can only make the assumption that The Kingdom was infiltrated by many other Whisperers in addition to Alpha, but the episode doesn’t even begin to suggest this. And how did they get all of these living people out of The Kingdom, over the walls, past the guards? It’s another case of the writers having a goal in mind, but zero idea of how to get to it, so they just skip over having to offer any kind of explanation because that’s the easy thing to do. — Connie is the best new character to join the show in the last few seasons, and I’m glad she’s okay. — I’m a bit fuzzy on The Hilltop hierarchy, but are we down to ZERO major characters who live there now? Jesus is dead, Tara is dead. Lauren Cohan is waiting to see if Whiskey Cavalier sinks or swims before she considers a return as Maggie. Who’s the de facto leader of that community now? You’ve gotta assume they’re going to be high bidders in the Daryl Free Agency Sweepstakes, if they think they can nab him as their new #1. — Has the term “Whisperers” actually been used this season at all? I realized that I’ve been calling them that because of the comics, but it’s odd to see members of all three major communities referring to them as “skin-jobs” all the time. There’s something inherently icky about that name, is there not? — Looks like we get to watch our heroes battle about 10,000 zombies in the near future. Will we top the “razor wire between two cars” sequence for the most gratuitous zombie kills in a single episode? In a lot of other episodes, some of these criticisms would really drag down the score, but in “The Calm Before” they’re easier to move past in the moment. There’s a lot here that makes no sense, but who cares when there’s also a lot here that is beautiful and poignant? This is quite clearly the most emotionally affecting episode in several seasons, with satisfying character moments and lump-in-your-throat creeping tension from start to finish. I wish all The Walking Dead could be so momentous, but that’s probably far too much to ask. Godspeed, Henry. May you find a quiet patch of paradise in the portion of heaven earmarked for below-average-intelligence blacksmith apprentices.